Financials in Europe have struggled big time in the past year! Are they about to send a bullish message to stocks in Europe and the States? Let’s investigate. European Financial ETF (EUFN) and Deutsche Bank (DB) both experienced large percentage declines in 2018. The large declines last year created new falling channels, highlighted by each (1). The rallies over the past 8-weeks have each testing the top of these falling channels at each (2). 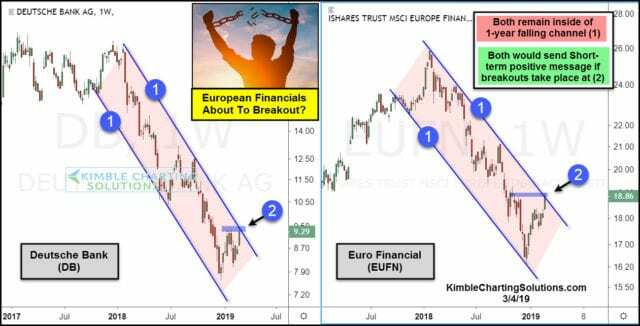 If EUFN and DB would breakout at (2), they would send a positive message to stocks in Europe and the States. The results of what each does at (2), should send important short-term to intermediate messages about how much further the 8-week rally could go or is it about to run out of steam!